24"x24" oil, acrylic, and graphite on wood panel. 2014. 'Hirari Hirari' solo show at Merry Karnowsky Gallery. Los Angeles, US. 24"x30" oil, acrylic, and graphite on wood panel. 2014. 35"x35" oil, acrylic, and graphite on wood panel. 2014. 20"x36" oil, acrylic, and graphite on wood panel. 2014. 36"x20" oil, acrylic, and graphite on wood panel. 2014. 12"x12" oil, acrylic, and graphite on wood panel. 2014. 13"x18" oil and graphite on wood. 2014. Hello Kitty show at JANM museum. Los Angeles, US. 18"x24" oil, acrylic, and graphite on wood panel. 2013. Scope Miami art fair with Thinkspace Gallery. Miami, US. 24"x24" oil, acrylic, and graphite on wood panel. 2013. 18"x30" oil, acrylic, and graphite on wood panel. 2013. 12"x12" oil, acrylic, and graphite on wood panel. 2013. 18"x18" oil, acrylic, and graphite on wood panel. 2013. Scope Switzerland art fair with Thinkspace Gallery. Switzerland, EU. 16"x26" oil, acrylic, and graphite on wood panel. 2013. 24"x18" oil, acrylic, and graphite on wood panel. 2013. 9"x12" oil, acrylic, and graphite on wood panel. 2013. 23"x23" oil, acrylic, and graphite on wood panel. 2013. 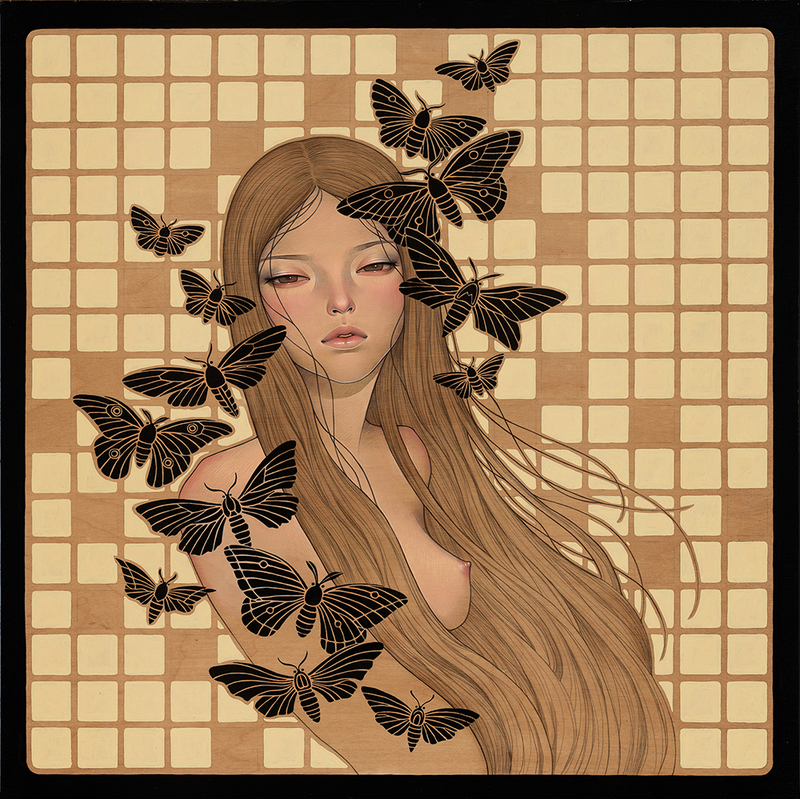 The Supersonic Electronic show at Spoke Art Gallery. San Francisco, US. 16"x16" oil, acrylic, and graphite on wood panel. 2012. 'Midnight Reverie' solo at Jonathan Levine Gallery, New York, US. 18"x24" oil, acrylic, and graphite on wood panel. 2012. 24"x28" oil, acrylic, and graphite on wood panel. 2012. 36"x36" oil, acrylic, and graphite on wood panel. 2012. 36"x24" oil, acrylic, and graphite on wood panel. 2012. 36"x20" oil, acrylic, and graphite on wood panel. 2012. 18"x30" oil, acrylic, and graphite on wood panel. 2012. 9"x9" oil, acrylic, and graphite on wood panel. 2012. 24"x24" oil, acrylic, and graphite on wood panel. 2012.